You'll like the Genesis if you are less concerned about brand prestige and more concerned about the driving experience and the vehicle's feature set. Best car in stock should be a plus to buy. I love the Bluetooth phone connector so I am able to use my phone hands free in the car. Onstar availability which is a plus. Has the hardwood interior leather seats. It has push buttons that enable locking and unlocking the car as long as keys are near vehicle. Has seat warmers. 6 CD changer. Has av USB and charging area. Lets me know exactly what door is open if someone isn't tied down. Also lets me know when maintenance is needed on vehicle. Lets me know if tire pressure is low and which tire. Really huge trunk. Compartment that leads from the backseat to the trunk. The vehicle I currently have is running pretty smooth even though it is salvage. I love the miles per gallon I am able to get when filling my tank up. The only issues that I have is when someone hit my car, they put a dent in my gas container. So that has made it sort of a hassle to get gas effortlessly, without the nozzle keep clicking as if it just stops on its own. Other than that, my vehicle is in great condition drivewise. It is very comfortable and feels very luxurious. It has a good bit of power but is easily controlled. I would highly recommend this car. I have had no issues with it, always starts right up. It has always been very reliable. It is my favorite car yet. My only complaint would be that the back seat does not fold down to add more space for the trunk. 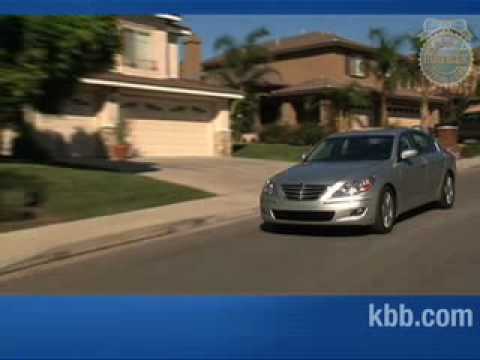 2009 Hyundai Genesis Sedan 4.6L V8 after 6 1/2 years of ownership.